The FIFA World Cup Fantasy game is finally here with days to go to the opening game and this summer, we are FF Titans will be fully committed to run coverage throughout the 30 days of action with our picks and advices. Our first coverage piece here focuses on the game play. On first look, this FIFA World Cup Fantasy is pretty similar to the FPL format, whom we are sure many many are familiar with. We will now focus on a few of the nuances to take note. The biggest difference between this game and FPL is of course duration. The World Cup will last 30 days and is split into seven gameweeks. Each full set of fixtures in the Group stages constitute to a gameweek and every subsequent round is a separate gameweek (PS 3rd/4th placing are included in the Final gameweek). In general, the deadline is one hour prior the kick-off of the first game of the round. Like FPL, no more transfers can be made after the deadline and you will at the mercy of late injuries and of players being dropped. You will be only given one free transfer per gameweek from GW1 to GW3. There is no concept of wildcards in this game, but there at the end of the Group Stages, you will be given an opportunity to make unlimited transfers, effectively helping you pick an entire team of new players from teams still left in the competition. From GW5 onwards, the number of transfer you can make increases – this needs to be utilised with care to transfer out players from eliminated teams. The key difference here from FPL is that the player valuation stays the same through out the Group Stages. This helps squad management over the first three gameweeks as you are unlikely to be priced out of transferring in form players. From GW1 – GW3, the three player per team limit applies like FPL. From GW4 onwards, this limit increases, catering to the fact that lesser teams are left in the tournament. by GW7 (Final), you can have up to 8 players from the same team, a concept perhaps unfamiliar to FPL managers. This is a key point in the game that is vastly different from FPL. There is an opportunity in the game to substitute a player during a gameweek should the player perform badly or fail to start. There is of course a catch to this, namely, if your player is sent off he cannot be substituted and you can only bring in a player whose team is yet to play. This means that you should place players from the later games (from teams in Group E to H) on your bench at the start of gameweek. You can start with riskier players from the earlier games then choose to replace them later on. The same theory applies for captain selection – you have the chance to change your captain during the gameweek too. This, in our opinion, is the differential between the top managers of this game and the average ones. This rule dictates that you should strategise by captaining someone from earlier games and swap them when they did not perform. Illustrative example: Your FWDs are Luis Suarez (URU, 15th June) | Antoine Griezmann (FRA, 16th June) | Harry Kane (ENG, 18th June). You should most definitely captain Suarez at the start. If he scores a hattrick, you keep him as the captain but if he fails to perform, you can change the captain to Griezmann and then to Kane in that order. Captaining Kane from the beginning is unwise as you will not be able to gamble on exceptional performances from Suarez and Griezmann. 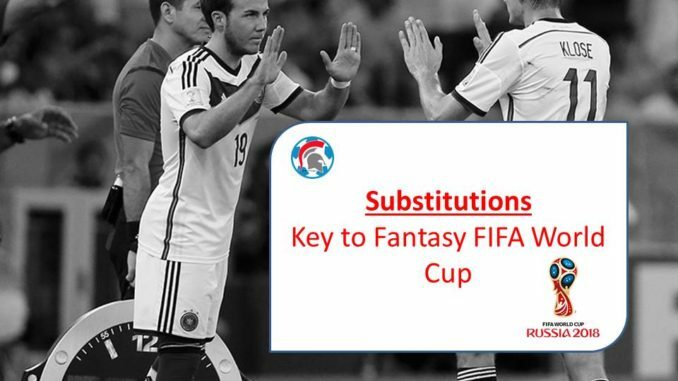 Also to note, if a manager does not actively make a substitution in the gameweek, the FPL-styled auto-subs apply (but not to the captain). Players who are substituted out will score 0 points. The captain bonus will be lost from your original captain if a new captain is selected. Substitutions and captain changes can’t be cancelled once confirmed. Known as Chips in the FPL universe. We will look at this in detail later on but for now, it is worthy to note that there are two boosters. The Bench Boost is the same as the one in FPL so needs no further elaboration. As opposed to the “Triple Captain” Chip, the booster in this game is “Maximum Captain”, enabling the manager to score double points on the player whom scores the maximum points in the gameweek. There are 12 achievements to unlock but at this stage, they appear not to matter to the overall scores.